The title of this product says it all, at least as far as constituent parts go—but I think it's the sea salt in particular that rounds out this snack in a very special way. 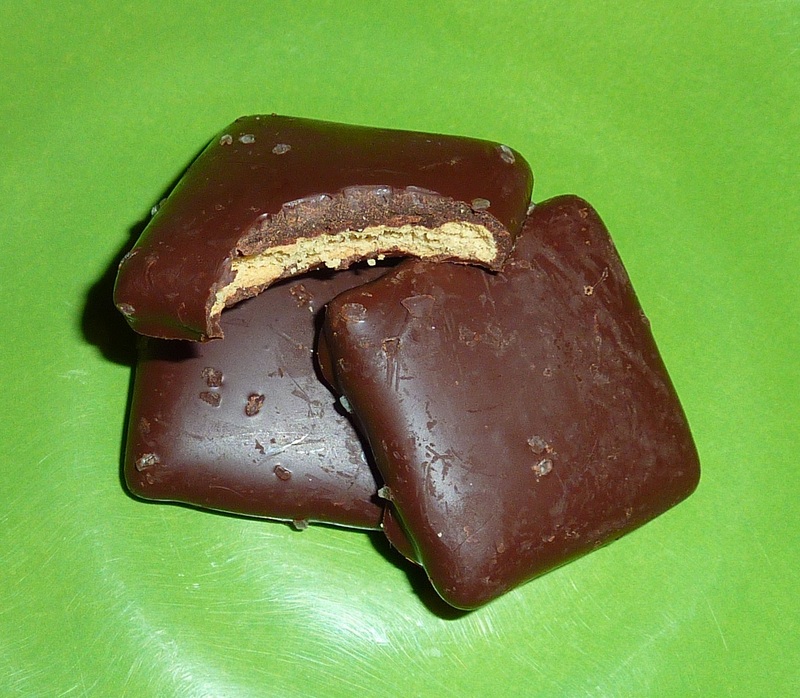 There are large granules on the outermost portion of the cookies, embedded in the dark chocolate, but big enough that you can clearly see them protruding from the otherwise smooth surface. In fact, I believe they're visible in our pic of the product. And flavor-wise, the sea salt crystals are very much a part of the attack. Upon first bite, the saltiness is present in spades, and it provides this beautiful balance to the bitterness of the cacao and the sweetness of the cane sugar and honey graham base. 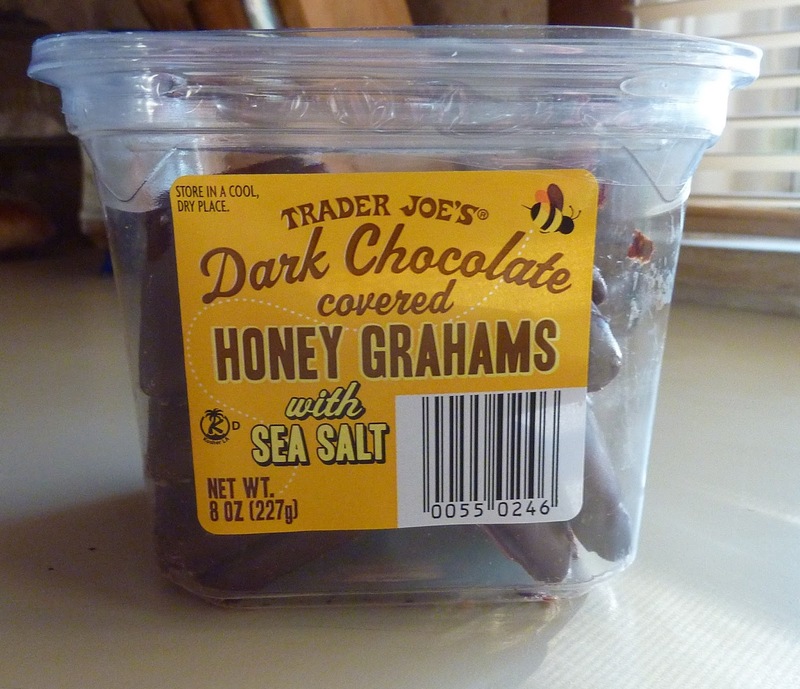 We've seen TJ's do great things with sea salt and dark chocolate before—quite a few times, actually—so many times that it would be difficult to link to each one individually. So I'll throw you guys this bone and link to the "Search This Blog" results for keywords "Sea Salt Dark Chocolate." Sonia shared this product with her co-workers and got pretty much universally positive reactions. I, on the other hand, work from home and have no co-workers I can share with, unless you count the dogs. And they can't have any chocolate. Just as well. I'm selfish and don't like sharing anyway...particularly when it's something this tasty. Texture-wise, the product is moderately crispy. Even under all that chocolate, the graham cracker still feels like a cracker. 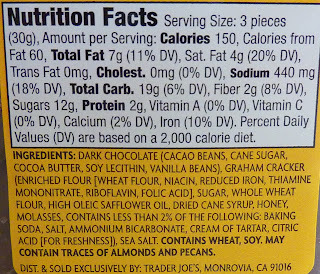 The sea salt actually adds a bit of extra crunch into the mix. Sonia tried an experiment with some leftover marshmallows we had, and she sandwiched them between two of these chocolate covered honey grahams to create a makeshift s'more. She enjoyed it much better than a traditional s'more and liked the added soft texture of the 'mallow. Maybe it's because they were only sitting out on the counter for a few short hours, but the dark chocolate didn't melt that much in this summer heat. I'm not usually a huge fan of any chocolate in the summertime, particularly dark chocolate—but one thing I do crave is salt. I sweat like crazy and I always want salty snacks this time of year. And along those lines, these unique little cookies deliver. Sonia liked them even more than I did. 4.5 from her. I'll throw out 4 stars. Sounds like my kind of treat. I see these and am thinking s'mores right away. 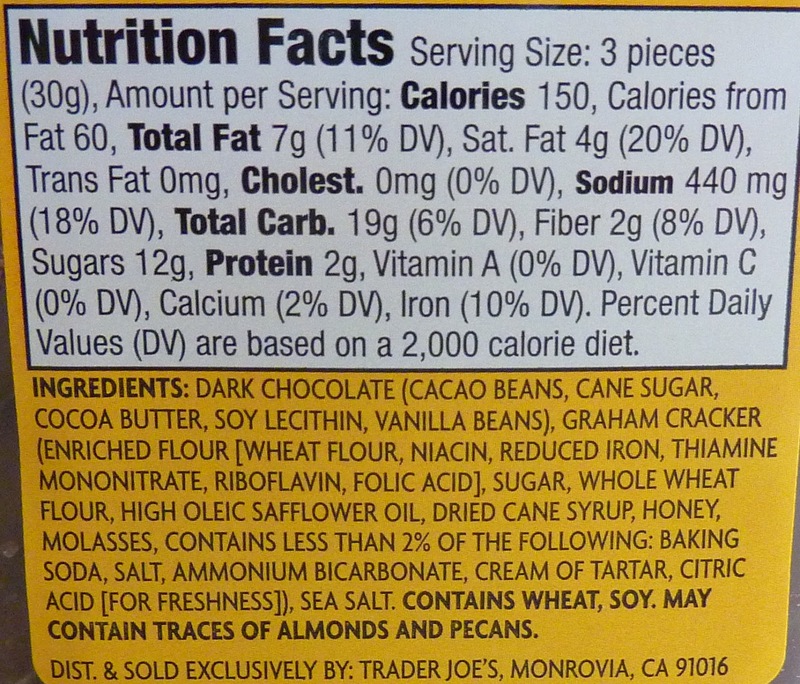 I'm in the minority, but I do not like salt in my chocolate, and these products are getting more and more popular. I got an idea why they didn't go ahead and put a layer of marshmallow in it. While it like "smashing smores" but flatter. OR COOKIE BUTTER! Like I said before with cookie butter. Cookie Butter marshmallows. Get it on Trader Joe's!!! COOKIE BUTTER MARSHMALLOWS!! !